In chemical engineering, chemical reactors are vessels designed to contain chemical reactions. One example is a pressure reactor. The design of a chemical reactor deals with multiple aspects of chemical engineering. Chemical engineers design reactors to maximize net present value for the given reaction. Designers ensure that the reaction proceeds with the highest efficiency towards the desired output product, producing the highest yield of product while requiring the least amount of money to purchase and operate. Normal operating expenses include energy input, energy removal, raw material costs, labor, etc. Energy changes can come in the form of heating or cooling, pumping to increase pressure, frictional pressure loss (such as pressure drop across a 90° elbow or an orifice plate), agitation, etc. Reactors, unlike mixing tanks, are totally sealed. Mixing tanks are designed to disperse two or more chemicals together. Reactors, on other hand, allow the chemicals inside to go through a reaction phase which ultimately produces new and different chemical properties. 50 Ltrs, 100 Ltrs, 150 Ltrs, 200 Ltrs, 250 Ltrs , 300 Ltrs, 350 Ltrs, 400 Ltrs, 500 Ltrs, 600 Ltrs, 700 Ltrs, 750 Ltrs, 800 Ltrs, 1 KL,1.2 KL, 1.6 KL, 2 KL, 2.5 KL, 3 KL, 3.5 KL, 4 KL, 4.5 KL, 5 KL, 6 KL, 7 KL, 7.5 KL, 8 KL, 9 KL, 10 KL, 12 KL, 15 KL, 20 KL. Available in GMP model and NGMP model, MS Jacket and SS 304 Cladding, SS 304 Jacket and SS 304 Cladding, Limpet Coil, Insulation. Available with Anchor agitator, PBT agitator, Propeller agitator, Hydrofoil agitator. SS 316, SS 304 and MS.
We are engaged in designing quality tested range of Industrial Reactor that is widely installed in chemical industry, metal industry and gas industry. These are the plants where chemical reactions are carried out between two or more substances. We construct these industrial reactors using finest stainless steel metal that are corrosion free and add to the rigidity of the plant. Our reactors are manufactured under the supervision of experienced engineers and professionals and all the quality parameters are thoroughly examined before being offered to the end customers. 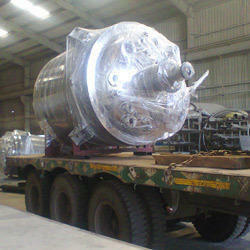 Our reactors are available in various capacities and dimensions as per the requirement of our clients. A Jacketed Reactors is provided on the Outside of the shell for Heating the reactor by passing steam or thermic oil or Cooling the reactor by passing cooling media. Stiffener Rings are provided on shell in between the shell and jacket to give uniform circulation of the heating or cooling media and to intensify the vessel. Agitator assembly mounted on the Top dish of Reactor consists of Shaft supported by Lantern Assembly on the Top End containing Bearing Housing with Tapered roller bearing and Ball bearing to withstand impact load and vibratory load ensuring smooth rotation of the Shaft. On the other end of the shaft Blade is fitted of different types as per the need of the Process viz. Single Anchor, Double Anchor, Turbine & Propeller types. Baffles are also provided inside the shell as per the requirement. The construction of Limpet Coil Reactor is same as that of Jacketed Reactor except instead of Jacket on the Shell of Reactor Limpet Coil is welded on it. Limpet Coil Reaction Vessel consist of a Cylindrical vertical shell with standard torispherical dish on both ends. Limpet Coil is Half round Pipes welded on the outer surface of the shell and also on the bottom dish of the Reactor. Limpet coil is made of either Mild Steel Or Stainless Steel. It is either Double end double start for both heating and cooling through limpet coil or Normal Single coil for either heating or cooling. Limpet Coil Welding is performed by using high grade filler rods depending on MOC of the Limpet Coil to withstand design pressure.